The Litepanels Sola ENG/Chroma/Luma 2-Pin D-Tap Power Cable (also known as Anton Bauer PowerTap) allows you to power the Sola ENG, Chroma and Luma LED lights with batteries that have a D-Tap power output. Box Dimensions (LxWxH) 5.4 x 4.0 x 0.8"
Sola ENG/Chroma/Luma 2-Pin D-Tap Power Cable is rated 4.0 out of 5 by 3. Rated 5 out of 5 by Marshall Staton from Nice cable! I haven't used this a whole lot but it's nice to be able to keep this and the Litepanels Croma on my camera and not have to worry about a bunch of AA batteries. If I use it on a light stand I put a v-mount battery w/ powertap in a bag and hang it off to the side. Can run for hours and hours and not have to worry about it. Rated 3 out of 5 by Scott N. from Solid build but expensive Great for powering your Croma from camera d-tap (AA batteries add weight otherwise). High quality materials and connectors. 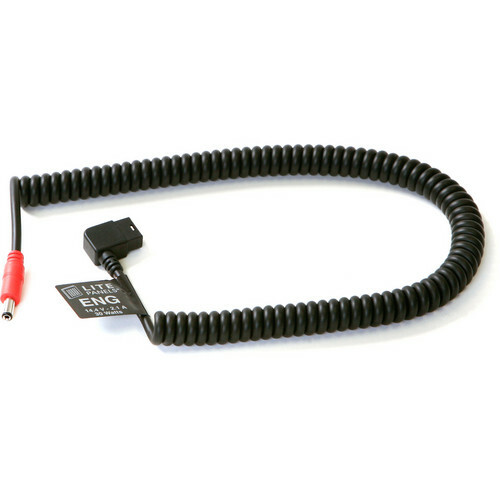 Good length, and coil cord keeps wires in control. Would get five stars if the price was more reasonable. Is the DC plug 2.5mm? I measured the end that goes into the Sola. The outside measurement across is 5mm. The inside measurement is about 2.5mm.